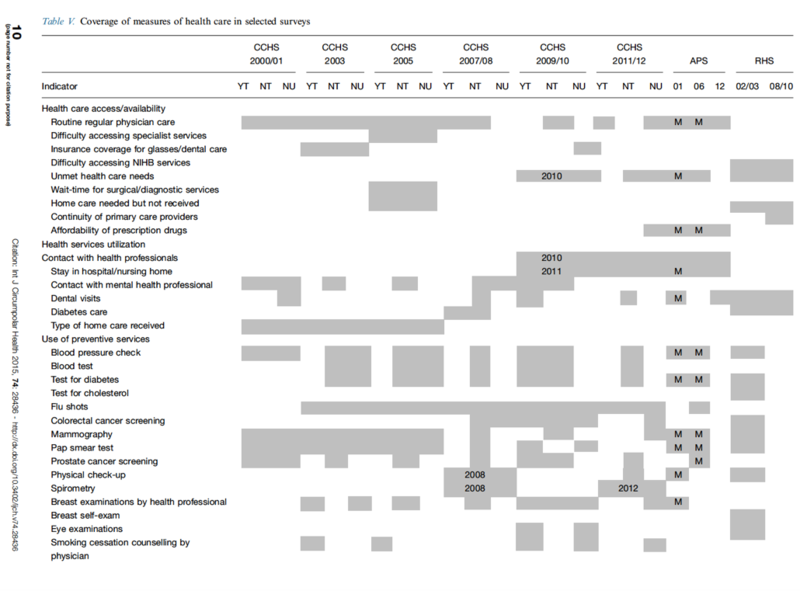 We explored the extent to which health care issues in northern Canada can be studied through secondary analyses of existing national and regional health and social surveys. We also identified potential areas for research. Methods: We consulted extensively the various user guides, data dictionaries and other documentation of these surveys, and reviewed published reports and data tables were presented to highlight certain issues and identify existing gaps. Main findings: Given the patchiness of coverage of even basic indicators in the North and its subpopulations across surveys, a comprehensive survey of health care is needed. Such a survey needs to be a sufficient sample size to enable disaggregation of the sample into urban and remote, Aboriginal and non-Aboriginal, and First Nations, Inuit and Me´tis within the North. Analytical studies can also be conducted to investigate the correlations and interactions among health status, health determinants and health care and assess whether such relationships differ among the different population groups. Such a survey can also focus on individuals with complex health needs, which can be identified as those with multiple chronic disease co morbidities, disabilities, and mental health challenges.